Apart from the odd sunny day, it’s still not quite warm enough outside to tempt me out for a run on week nights. I’m not very keen on running at the best of times and if it’s cold and damp then I feel more like jumping under the duvet when I get home from work! It’s really important to me to do some exercise nearly every day as a mood booster, but I’m also making a concerted effort to do regular exercise at the moment to build up to a few fitness goals I have for summer. 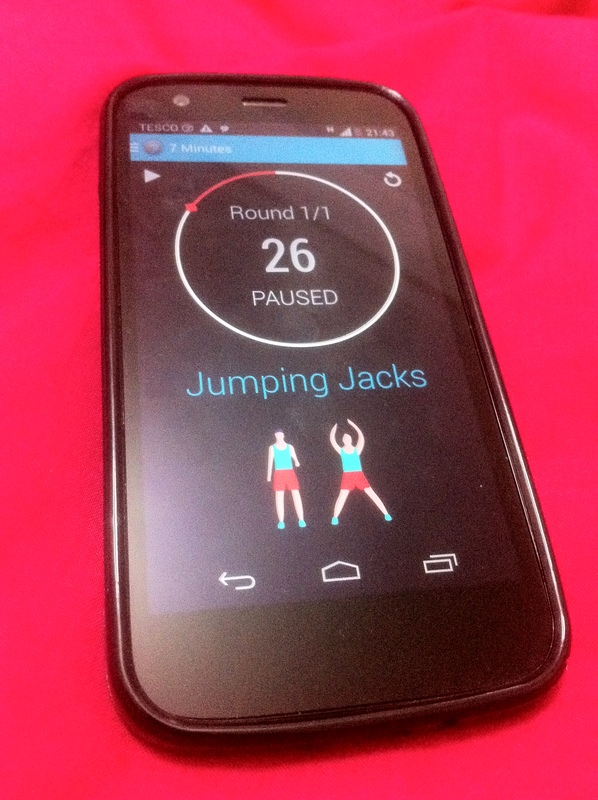 At moment I’m using one of the 7 minute workout apps to get me going. There’s been a lot of hype about these workouts in the last year or so – research indicates that short high intensity workouts such as these produce the same fitness benefits as 30 minute sessions. All you need is a chair or sofa, a section of wall and space to lie down. Perfect for my tiny flat! The ‘voice’ of the app leads you through a series of short exercises with short rests in between. It’s weirdly compelling which is great when you’re lacking in motivation. The app I use is free and is just called ‘7 Minute Workout’. The app leads you through a series of short exercises with a short break in between. Unfortunately, with this app it’s the same 12 exercises, in the same order, every time. I think it would get boring if you did it every day, but unless I’m really short on time, I only use it to lead into something more fun. I do like the range of exercises though; they focus on areas that I tend to neglect. Once I’m warmed up I generally have a bit of dance around my flat – it’s a great de-stresser too. I’ve got wireless headphones – my boyfriend bought them for me after watching me wreck two headphone cables in six months with all my flailing around! What I’m listening to varies on my mood but it’s generally upbeat so there can be plenty of jumping around and booty-shaking! If I’ve still got energy left after that then I’ll finish with a few pilates exercises and some stretches. I’m trying to be disciplined this last part as I’ve had to have physio in the last few months to recover from a knee injury. What do you do to get going? Exactly. I want to try a couple of other ones out there too! ← Outfit: It’s still cold outside!